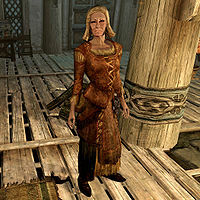 Bergritte Battle-Born is an elderly Nord living in the House of Clan Battle-Born in Whiterun. She is the wife of Olfrid Battle-Born and has two children, Jon and Alfhild. Alfhild is married to Idolaf and they have given Bergritte her first grandchild, Lars. As family elder, she lives a relatively anonymous existence in Whiterun. She wakes up early at 6am and spends her morning in her favorite chair, eating and relaxing. At noon she heads over to the Gildergreen and listens to Heimskr's ramblings until she goes down to the market at 3pm. At 6pm she returns to the house for some dinner before her bedtime at 8pm. She wears a set of farmer clothes with a pair of boots and a hat. She carries the house key, an iron dagger, and a selection of common items and gold. When approached, she will provide some random information, saying, "There's a rift here in Skyrim, and can't neither magic nor the passin' of time make it right. ", "Evgir Unslaad has come at last. The 'Season Unending.' War... without end. ", "Can you believe those pathetic Gray-Manes still show their face in public?" and "There was love between our families. For generations. Now, there is only enmity." If Whiterun was conquered by the Stormcloaks during Battle for Whiterun, she will hatefully add, "It's a miracle these Stormcloaks haven't robbed us blind yet. I'm sure it's only a matter of time." Bergritte: Lars, dear, why don't you go outside and play? It's a beautiful day. Lars: That's all right, grandmother. I like staying home with you. Bergritte: It's that Braith girl again, isn't it? Has she been bothering you again? I've a mind to speak with her mother. Lars: No! Please, grandmother, don't do that. I'm fine. Really. Can we just... not talk about this anymore? Alfhild: So, what book should I read to you tonight? Bergritte: How about "The Lusty Argonian Maid"? Bergritte: You've got no sense of humor, you know that? Why don't you pick up where you left off with "The Real Barenziah". Bergritte is a member of the warrior class, which determines the level of her skills. This page was last modified on 7 July 2018, at 21:14.